PENUMBRA. FASHION WEEK Spring Summer (SS15) is a diverse and innovative fashion experience that will feature 43 talented designers, both established and emerging. The bi-annual one week event remains one of Second Life's greatest fashion platforms and the launch pad for SL's fashion designers to a wider audience. The focus has been on showcasing the immense and diverse design talent that is evident year-on-year. May 16th to 23rd, will be packed with an array of 15 spectacular runway and trunk shows, a grand bridal showcase at the finale and will feature over 200 new designs from the designer showrooms, along with fun-filled events, on-site boutiques, entertainment and parties. Join us as we experience the color of spring and summer of Second Life and let us, together, discover the future leaders of fashion. 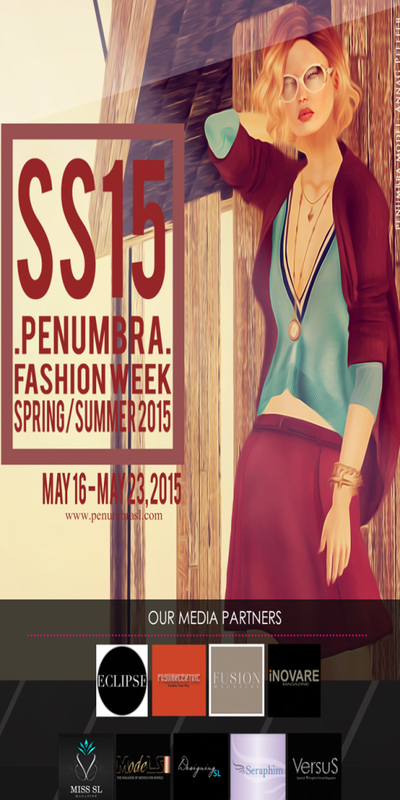 PENUMBRA is the premier fashion event showcasing the newest collection by top and innovative, cutting edge, and emerging Second Life's designers. .PENUMBRA. offers high-quality fashion events and marketing for both the consumer and the fashion industry.